Delaware Tribe of Indians sometimes called the Eastern Delaware, is one of three federally recognized tribes of Delaware Indians in the United States. The Delaware Tribe of Indians are based in Bartlesville, Oklahoma. Tribal membership is limited to descendants of Delaware people on the 1906 tribal rolls from Indian Territory. There is no minimum blood quantum requirement. The Delaware Indian originally called themselves Lenape people which means something like “The People.” However, they were given the name Delaware because they lived along the Delaware River, and the river in turn was named after the governor of the Jamestown colony, Lord de la Warr. The Delaware name later came to be applied to almost all the Lenape people. The Delaware were the first Indians to come in contact with the Europeans (Dutch, English, & Swedish) in the early 1600s. The Delaware were often called the “Grandfathers” because they were respected by other tribes as peacemakers and often served to settle disputes between rivaling tribes. They were also known for being fierce and tenacious warriors when they had to fight, however, they preferred to be peaceful. Early treaties and land sales were signed with the Europeans because the Delaware believed them to be more like leases. The Delaware had no idea that land was something that could be sold. They believed the land belonged to the Creator, and were only using it to shelter and feed their people. To the Delaware, when the poor, bedraggled people got off their ships after the long voyage and needed a place to live they simply shared the land with them. They saw the few token gifts the Europeans gave them as acts of gratitude for their people’s kindness, but to the Europeans these gifts were actually the purchase price for their land. The Delaware people signed the first Indian treaty with the newly formed United States Government on September 17, 1778. Nevertheless, through war and peace, the Delaware would continue to give up lands and move westward (first to Ohio, then to Indiana, Missouri, Kansas, and finally, Indian Territory, now Oklahoma). Through different migrations, one small band of Delawares left the group in the late 1700s and are today located at Anadarko, Oklahoma and known as the Delaware Nation. Small contingents of Delawares fled to Canada during a time of extreme persecution and today occupy two reserves in Ontario and are known as The Munsee-Delaware Nation. In 1867, after dealing with the United States on a government-to-government basis, the ancestors of the Delaware Tribe of Indians agreed to relocate to Oklahoma, to live within the Cherokee Nation. The Delaware Tribe of Indians operated autonomously within the lands of the Cherokee Nation. After the passage of the 1972 Appropriations Act the Delaware Tribe of Indians sought federal recognition separate from the Cherokee Nation, and in 1975 it was granted. However, in 1979 the BIA revoked the status. The BIA had determined that the Department of the Interior would generally engage in government-to-government relations with the Delaware Tribe only through Cherokee Nation, and that the Department would engage in direct relations with the Delaware Tribe solely with respect to the Tribe’s claims against the United States. Then in 1991 the Delaware Tribe of Indians regained their federal recognition by the Secretary of the Interior. However, the Cherokee Nation disagreed with the decision and filed suit against the BIA and the Secretary. This lead to the Delaware Tribe losing federal recognition again in a 2004. After years of negotiations, the issues were finally resolved and on July 28, 2009, The United States Department of the Interior notified the tribal office in Bartlesville, Oklahoma, that the Delaware are again a federally recognized tribe. The Delaware Tribe of Indians are based in Bartlesville, Oklahoma and have no tribal jurisdictional area..
Project History: In 1997 we received a Planning Grant from the ANA (Administration for Native Americans). We did a survey of tribal members concerning their interest in learning the Lenape language. A total of 4,350 questionnaires were mailed out to heads of families. As of March 1, 1998, the total number of questionnaires completed and returned was 1,269. Respondents stated that a total of 2,154 people in their households would be interested in learning the Lenape language. Questions were asked about which topics would be of the greatest interest, and some of the items of interest were: Greetings, 91.3%; Basic grammar, 84.3%; Creating sentences, 80.5%; Kinship terms, 77.6%; People, 77.2%; Prayer words, 76.2%; and Numbers, 74.8%. 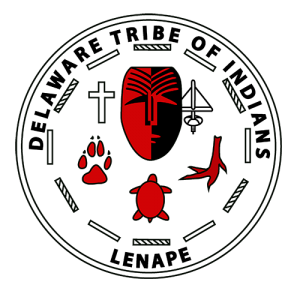 In 2002 the Lenape Language Preservation Project received a grant from the National Science Foundation to produce a dictionary database of Lenape. We had the database built to create a Lenape Talking Dictionary. Much of the funding went to digitizing and preserving our existing audiotapes which were made in past years with native speakers of Lenape. Please visit the dictionary at www.talk-lenape.org. In 2010 we again applied for a DEL (Documenting Endangered Languages) grant from National Science Foundation. We received notice that funding would begin April 1, 2011. This grant is being used to make improvements to the existing Talking Dictionary, and these language grants were written by project director, Jim Rementer. Some of the newer features to be added will be the ability to search for works by entering the Lenape word or portion of a word. For example, if you find that the name of a certain tree in Lenape ends with “menshi” you can enter just that and you will find many other trees with the same ending. It will be easier to view the plural of the Lenape words which are often in a different location due to having a separate sound file. This will be especially helpful when the English plural looks different from the singular such as mouse/mice. Another feature is the addition of traditional stories in Lenape. The plan is to have these where they can be played one line at a time, or by paragraphs. There will be the English translation line-by-line. After years of conflict and negotiations, on July 28, 2009, The United States Department of the Interior notified the tribal office in Bartlesville, Oklahoma, that the Delaware are again a federally recognized tribe. Today the Delaware Tribe of Indians is growing, vibrant community. They offer many services and programs to their members including; elders services, community services, and educational assistance. Some of their programs includes a wellness center, an environmental program, and language revitalization. They also have a tribal housing program which covers Washington, Nowata, Rogers, Craig and Part of Tulsa Counties. Their annual tribal economic impact is $2 million.